Let there be peace on Earth and good will to all! 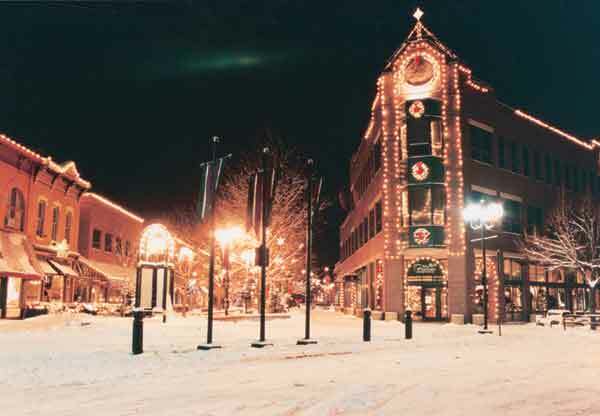 First Night Fort Collins: New Year’s Eve – Enjoy the wonderful and diverse entertainment presented at this non-alcoholic New Year’s Eve celebration. First Night Fort Collins 2013: “Enchanted Voyage” promises new performing acts, storytelling, history, interactive craft projects, old favorites, street performers, international dancing and much more. Great Plates: Thirty (30) downtown restaurants will offer amazing evening dining specials for a full two weeks, to benefit the Food Bank for Larimer County. St. Patrick’s Day Parade: keep a lookout for green bagels from Gib’s! A Fort Collins Jazz Experience: A week long set of jazz related events and concerts build up to the weekend when Saturday’s Downtown Sessions brings jazz to the forefront. Taste of Fort Collins: This two-day festival offers attendees food from local and national restaurants, entertainment from regionally and internationally acclaimed musicians, and an eclectic display of fine artisans work as well as the region’s best crafters. I realize I may well be missing a few here, and I welcome additions! Leave a comment below. “Aw, come on!” Erik thought, “What could the cook possibly know? She never leaves the kitchen! Someone must have seen something!” He stretched up from his toes and spotted another guard, and ran, a smile across his face. This fellow looked alert, but maybe Erik was too confident. “Excuse me,” Erik said politely, but the guard did not react. “Excuse me, sir,” he tried again. But Erik’s patience was about to run out with the wind. “Sir!” he finally shouted, startling the guard who stumbled in a clamor of tinny armor. “I say, must you shout about?” he protested. Erik wasted no time and shrugged off bone-chilling images of the castle’s dark bowels. With the empty box under his arm, he dashed to the stable to fetch his pony and head for the forest. Way back in the 16th century “fancy” meant love. In the 17th century “footloose” meant you were free to go anywhere. On the fourth of July in the United States we celebrate Independence Day and our freedom. So today I ask, how footloose are we when our government can and does restrict the freedom to go anywhere. Especially Cuba. Ordinary citizens cannot just hop on a plane headed directly to Cuba. Actually it is not technically illegal, but unless you are a journalist, a student obtaining credits or are a Cuban-American visiting relatives you are prohibited from spending money there. You may have heard that President Obama made a few changes in policy earlier this year and now the Treasury Department can again grant “people-to-people” licenses, which President George W. Bush had stopped issuing in 2003. Now in order to go you have to sign up with a licensed operator who has to apply for and be issued said license. Ah, but the Treasury Department has guidelines: the tours must “have a full-time schedule of educational exchange activities that will result in meaningful interaction between the travelers and individuals in Cuba.” You can’t bring back any famed cigars or rum for Uncle Bill either. So, if your feet are restless to experience the forbidden fruits of a 50 year embargo, learn the steps of the traditional Cuban Habanera: the pace is slow and the movements are delicate. Click to view One Dance, One Song – La Habanera a film by Pascal Magnin, embraces my intentions in spite of it being filmed in Buenos Aires and interpreting Bizet’s aria from the opera Carmen. Happy Fourth! And know your freedoms!